Based in the heart of Central New York, Rick’s Wheels powder coats a lot of truck wheels and rims, truck parts, bumpers, running boards and industrial equipment. Powder coating is so popular with commercial fleet owners because it offers excellent coverage and outstanding long term durability. Unlike paint, powder coating, when performed correctly, is able to penetrate those hard to reach areas of commercial truck wheels and rims, running boards, and other commercial vehicle equipment without creating light spots or running. Our combination of wheel preparation, powder application, curing, and continuous quality control ensures that your wheels, rims and equipment receives the finest, most durable quality finish for years of future service. Contact us today to discuss your needs. At Rick’s Wheels, we offer dependable, quality powder coating services for business, commercial, industrial and municipal projects in Syracuse and Central New York. We have been serving business of all sizes in the Syracuse area since 2001, offering powder coating for every project imaginable – from signage, canopy frames, metal furniture, benches, lighting fixtures, fencing, handrails and more. We can powder coat individual pieces, small to medium batch runs. We can also help with industrial machine restoration, metal furniture restoration, as well as refinishing shelving, gates, tools, and equipment. We also provide service for custom design and one-off projects. 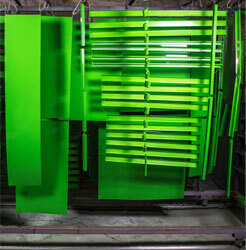 We invite you to consider the cost effective benefits of powder coating for your next project. It provides outstanding durability, UV resistance, abrasion and wear resistance, as well as being environmentally safe thereby providing a much more economically viable long term solution when compared to traditional painting.